It is an interesting phenomenon that the Pentecostal and charismatic movement grows rapidly among the poor, something that has been explained with the charismatic promises of healing, prosperity and answered prayers (Togarasei 2011, Pfeiffer et al 2007). But how do charismatic churches in developing nations tackle the poverty of their members? In 2007, Donald Miller and Tetsunao Yamamori published a book called Global Pentecostalism: The New Face of Christian Social Engagement. Originally the authors wanted to write about churches in general that work with social justice in developing nations, but when they, to their surprise, discovered that the vast majority of churches that did so were Pentecostal, they decided to study this movement further. 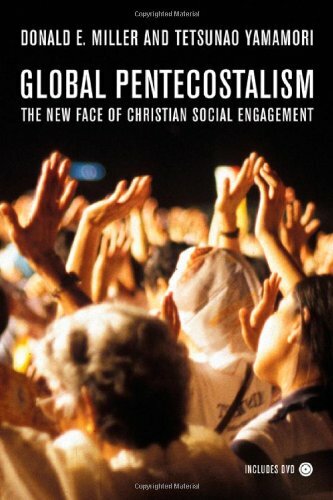 According to the authors, the stereotype of Pentecostals being so caught up in eschatological expectations and evangelistic focus that they are not “wasting time” on social and political change (Miller & Yamamori 2007, p. 21), is not very relevant for Pentecostal and charismatic Christianity in the global south. Instead, the authors come up with the term “Progressive Pentecostals” to describe what they believe is very common: Pentecostals seriously involved in social action. Throughout the book, they give examples of how Pentecostals and charismatics run charities as well as mobilize political campaigning for social justice as a result of their faith. The authors contrast Progressive Pentecostalism with another stream of Pentecostalism: “prosperity or ‘health and wealth’ churches” (Miller & Yamamori 2007, p. 29). Originating in the mid-1900’s in the United States, it is a theology influenced by individualism and materialism that at least originally claimed that if you have strong faith you will be constantly healthy and rich. Modern forms of prosperity teaching are often more nuanced, but the basis is still that God always wants to heal and bring financial blessings to a believer’s life. This theology is very popular in Africa. Even though Miller and Yamamori note that some prosperity churches are involved in social action as well, they argue that many are too busy with revival meetings and that their theology defends inequality – there are examples of how prosperity pastors live in luxury while their church members are very poor. However, Lovemore Togarasei (2011) defends the prosperity gospel and argues that even though there are examples of abuses, the gospel is generally positive for poverty reduction. This is because the message of the church suddenly is not only about how to get a good life after death, but also here and now. This will be a motivation to help oneself while trusting in the blessings of God as well, according to Togarasei. Miller, Donald E. and Yamamori, Tetsunao, 2007: Global Pentecostalism: The New Face of Christian Social Engagement, University of California Press, Berkeley, CA. Pfeiffer, James; Gunnel-Sherry, Kenneth & Augusto, Orvalho Joaquim, 2007: “The Holy Spirit in the Household: Pentecostalism, Gender, and Neoliberalism in Mozambique”, American Anthropologist, volume 109, issue 4, pp. 688–700. Togarasei, Lovemore, 2011: The Pentecostal Gospel of Prosperity in African Contexts of Poverty: An Appraisal, Exchange, volume 40, issue 4, pp. 336–350. By Micael Grenholm in Charismactivism on December 12, 2013 . Fascinating stuff! I had no idea about Progressive Pentecostalism. Are you on Twitter or fb? If so I could dm you my email address. i don’t know too much about the history of the pentecostal movement but i find it strange to hear that pentecostals are just now getting more into social justice issues. i’m really not sure that is an accurate claim. due to their diversity and azusa street springing up from the poor & marginalized it is the large pentecostal churches here in los angeles that have been working for decades to help their members climb out of poverty. this is in addition to their many missionary efforts overseas. also, i find it a bit strange to call them “progressive pentecostals” as that implies they got their social conscience from the liberal/progressive stream of christianity whereas i would think that came more from pentecostals’ roots in the holiness movement. it may be that pentecostals are now turning more of their vision to the domestic sphere rather than focusing primarily on overseas work. there is some good info in vineyard author rich nathan’s book ’empowered evangelicals’ about the 20th century history of the 3 waves of the Spirit starting with the pentecostals of azusa street then moving on to the charismatics in the mainline churches & Catholicism and then lastly with 3rd wave groups like the vineyard. interestingly, nathan distinguishes the early pentecostals as a separate movement from evangelicals and says only later have they started to merge with the evangelical stream of christianity. really, i think it may be more the evangelicals who are just now discovering their social conscience rather than the pentecostals. Hi Linda! Thank you so much for your comment. I completely agree with you that numerous Pentecostal churches are involved in poverty reduction on both a local and a global level (as well as many charismatic and third wave churches also), and have been doing so for a long time. I don’t want to downplay that by any means, it shows that the Spirit brings both gifts and a heart for the poor. Rather, what I adress above is the lack of pacifism and economic equality and prevalence of violent Zionism and prosperity theology within Pentecostalism. This is something I find inconsistent with the Scriptures; Jesus told us to love our enemies and despise treasures on earth, 2 Cor 8 says that we should pursue economic equality and the early church in Jerusalem practiced community of goods. The early Pentecostals were well aware of this and refused to join the army, and they criticized capitalism and when the rich oppress the poor. But in the middle of the 20th century something happened. Not many Pentecostals remained pacifist, but supported nationalism and war policy instead. Paul Alexander has described this in his book From Peace to War: Shifting Allegiances in the Assemblies of Good. Many Pentecostals embraced the dispensationalist theology of Christian Zionism and supported war policy in the middle east. At the same time, prosperity theology grew in popularity, where wealth and inequality was defended and not criticized at all. True Christian life was seen as a rich life with expensive houses, cars and stuff. The idea that Christians can be rich is very prevalent in the Western church today, even outside prosperity circles. Of course, even churches that defend wealth and inequality usually practice some form of poverty reduction anyway. But since the goal is not equality and since one allows the rich to keep a lot of money for themselves, this is far from the Biblical model. This is why Miller and Yamamori differentiates between prosperity churches and progressive Pentecostal churches. Even if there are some exceptions, they argue that these generally are inconsistent. Progressive Pentecostals, they argue, are genuinely passionate for social justice, and they are many. I agree with you that the term Progressive Pentecostalism is not optimal – it’s the term of the authors and while they do state that progressive Pentecostals can be (and often are) theologically conservative, they still describes them as progressive because of their passion for justice. I think the conservative-liberal scale is very bad though, and doesn’t capture what Jesus modeled. God bless you very much, and merry christmas! merry christmas to you micael! keep doing what you’re doing. i enjoy reading your blog. i was just reading about a charismatic guy who was instrumental in the jesus people movement, lonnie frisbee. i think you’d find him interesting if you haven’t already heard of him. he is little known because of some controversy in his life. he is being rediscovered after being left out of the jesus movement history. there is a documentary about him, and i just read the first book of his 3-part autobiography which was amazing. it’s called Not by Might, Nor by Power: The Jesus Revolution. God did amazing things through him even if he did falter later. Yes, I know about Lonnie and love reading what God did in his life. I’ve primarily encountered him when reading about the life of John Wimber and the birth of the Vineyard movement, which was very impacted by Lonnie’s Jesus Movement, but I haven’t been able to read something that focus on Lonnie yet. I will check out what you recommend! I love how the Jesus Movement combined zeal for evangelism and the gifts of the Spirit with activism and pacifism.